Anne McTaggart MSP has marked International Credit Union Day by congratulating Scotland’s credit unions and supporting their continued growth. This annual celebration is marked on Thursday October 16th by credit unions across the globe. Credit unions are financial services providers locally owned and democratically controlled by the people who use them. They do not have any external shareholders or investors looking to generate profits from them. 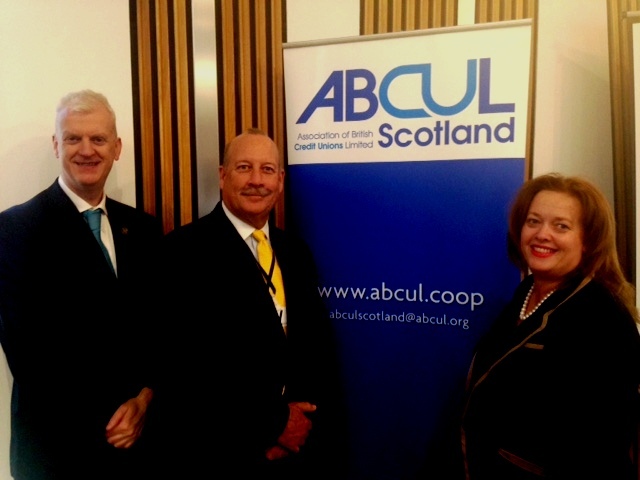 The Scottish Parliament hosted a special visit from Joe Schroeder (right), Chief Executive of Ventura County Credit Union in California, who was in Edinburgh to speak at a reception organised by the Association of British Credit Unions Limited (ABCUL). ABCUL Chief Executive Mark Lyonette (left) was also in attendance. Ventura County Credit Union serves more than 66,000 members, holds over £450 million in assets and offers a wide range of financial services including current accounts, credit cards and mortgages. Credit unions in the United States now serve over 100 million members, and Anne McTaggart MSP took the opportunity to meet Joe to hear how America’s credit unions have achieved this success and the lessons Scotland’s credit unions might be able to follow. Ms McTaggart said: “It was great to meet Joe Schroeder to hear how American credit unions have grown to provide a full range of services to people from all walks of life while retaining their community focus and co-operative values. 57,000 credit unions in 103 countries serve a global membership of 208 million people. In Scotland, just over 100 credit unions already serve over 355,000 people who are saving more than £400 million and borrowing more than £260 million. Everyone in Scotland has a credit union they can join, and between last September and March, an average of 550 people joined a credit union in Scotland every week. Find out how to join the Glasgow Credit Union here.